Hi. I’m Terry. In this video series, we’re going to talk about locksmith pick guns. As a beginner locksmith and someone who’s learning how to pick locks, just practice picking the various methods you’ve seen in the my other videos. Pick guns are a little bit addicting because they do work and can pick the locks open. I have tried every manufacturer. Some of the pick guns last forever, some of them break right away, some of them are sealed units, some of them you can strip down and replace parts. 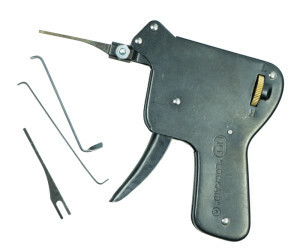 There’s various manufacturers of the pick guns, Life LockAid and Majestic pick guns. Some are sealed units and others you can take apart. They’re not expensive. The offshore pick guns, don’t buy them, they are going to break. They won’t even last a day. The pick guns are good for pick open Kwikset, Schlage, Wesiers, something with a keyway where you can get the pick gun into. They work basically by they bounce the pins. It’s almost like bumping. They has to be has a free, so they can bounce and not grab and not get twisted. Do not twist the pick gun, you don’t turn them, get them in there nicely, and we’ll go over that. I know Kwiksets are super easy to pick anyways, but sometimes you get a lock that giving you a little bit of trouble. Not all locks are 100% pickable. Even a Kwikset, if it’s got a sticky pin or something wrong, it won’t pick. Then you use out your other tools. You could go to a pick gun, you could go to electronic pick guns, the vibrating pick guns, right up to bump keys. Our final pick is the rotary pick. If you can’t get it open, you drill it. We are locksmiths, we have to be able to get through that door. It’s a little bit different if you have a door where they don’t care how much time and effort you have to pick it open with no signs of entry, different story. You try different tools, but as we’re locksmiths, I only give it about 10 minutes tops. If I can’t get it picked in any of the various methods, then I’ll go to the rotary pick too. There’s no shame in using the rotary pick. We are in business to make money, but this talk about the pick gun. There are several manufacturers and they’re very similar how they work. I have to admit I am a lock picker and not really a pick gun person but they do work and all it requires is practice. The pick guns all have various tension from high and low. I always recommend going low tension to start. The interesting thing is I tend to like a very simple pick, just the straight pick. There’s different angles, different leverage, some of them have wavy. All you really need is keep it simple, and put it into the lock and you just got to get it nicely in there. It doesn’t matter which manufacturer you use, they’re all extremely very similar. You have the pick, I always like the straight pick, you have the trigger. This is the tension adjustment. It goes from low to high. Some of them say maximum. This one you can actually pull apart, replace pieces, fix it. What I always do, I start it off on low tension to start with, and then when it’s not picking, I just give it a try, then I adjust my tension. This one I would start off on low. Sometimes it picks. Again, light tension on your tension wrench, pull the trigger, just give it a couple turns, couple more tries. Again, some people like two clicks, I like three, you just got to use what you’re used to. Keep on adjusting it until you open it. If it doesn’t open, going through this, then try another methods. Bring out a bump key, or maybe you have to drill it. I like to use WD40. I like to go in from the top of the profile, let’s adjust that. Light tension to start. I find it really important to be light tension, don’t crank her, I know this is a Ridgid, but you could really crank these. There’s no point in it. You’re just going to bind everything. I like light tension. 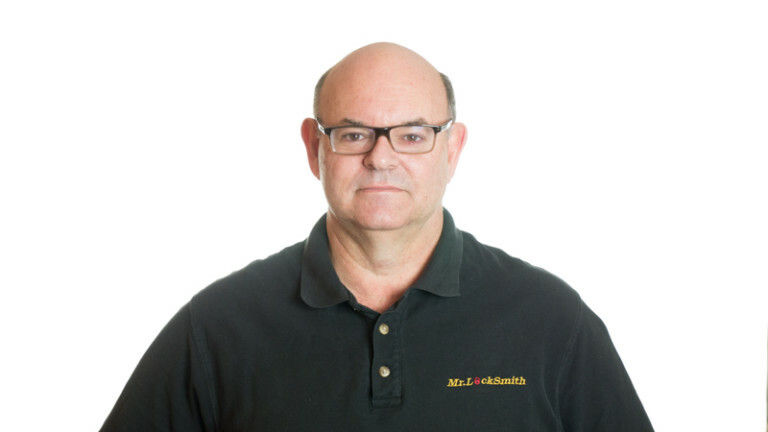 A locksmith should have gentle hands. Light tension, oops that was all ready to go. The interesting point with a pick gun if you have a Y1 keyway like the Yale, some of the more complex profiles like European keyways you are not going to get the pick gun inot the key way and get a good hit at it, so that’s the limitations of this style of pick gun. It doesn’t do some of the pancentric keyways. It’s a little bit more difficult. Kwikset, Weiser, Schlage, absolutely fantastic and east to pick.